Content is what drives the web and our online businesses. Think of it this way … the more content you have out there, the more potential customers and subscribers will find you and get to know you. Search engines also happen to love lots of fresh, new content and it’s something I’m constantly working on adding to all my niche sites. I’m sure you can think of even more forms of online content. In the beginning it’s easy. You start out with a big list of things you want to “talk” about. But eventually this initial well of information dries up and you’re sitting there trying to come up with something else to say. 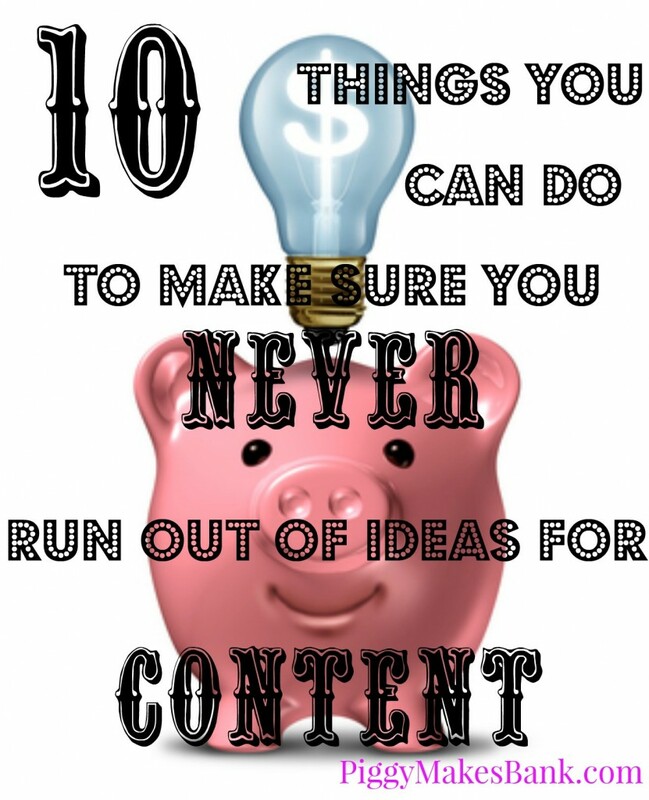 Here are 10 different ways to brainstorm new content ideas. Use them anytime you’re sitting down to write a new blog post, create an article or record a video that you can then upload to YouTube. Take a look at your blog categories and come up with 3 or 4 blog post ideas for each. Go ahead and save them as drafts, then come back and write the content later. Open up your email client and look through some of the emails you’ve gotten and responded to. You can often take one, edit it a bit and post it as a blog post. If you’re not comfortable doing that, use the questions and your reply as a starting point for a “how to” type blog post. Take a look at comments you’ve gotten on your blog. Did some questions or side topics come up that you can expand upon? Look at your traffic stats and find your most popular blog posts. Can you expand on the topic, explain it in a different way? Similarly you can take just about anything you’ve written and approach it from a different angle. Did you write a post about email copy writing? Rework it into copy writing tips for bloggers. I love looking at the various keyword I rank for in the search engines. Just going through the list is often enough to give me some ideas for new blog posts. Best of all, I know people are searching for those topics. Once you have a few hundred regular readers (or less), don’t be shy… ask them what they’d like you to cover next. After all they are the audience you are writing for. Give them what they want and need. (They’ll also tell you what products they need if you pay attention – which makes for easy sales). Grab one of our PLR packs and use them as starting points for blog posts and articles. You can rewrite an article or use just one point in there and expand on it. You can also bundle the articles into a free report that you can then distribute on your site. Just read up on topics that interest your target audience. Browse some popular blogs or look through tables of content of books on Amazon. You should get all sorts of content ideas this way. Grab a pen and paper or open your favorite mindmap program. Start with your main topic and then just start adding topics and ideas from there. You can also look at each idea you’ve written down and come up with related ones from there. I’ll show you tomorrow how I use those doodle sketches or mind maps to come up with all sorts of blog post ideas. I’ll take some pictures which I’m sure will explain this process better.